We carry a wide range of products for training your dog, including interactive toys, crates and fabulous treats. Please visit our online store to view our top products. The benefit of using positive reinforcement is that it really works! It also avoids any negative side effects that can be associated with the traditional techniques such as choke collars, pinch collars, e-collars and leash corrections. Training using positive reinforcement is FUN for you and your dog! It also can help you build a loving,trusting, and gentle relationship with your dog. We offer personalized behavior counseling and modification, utilizing positive reinforcement techniques as solutions for behavior problems. Is your dog ... ? Is your dog having problems with ... ? 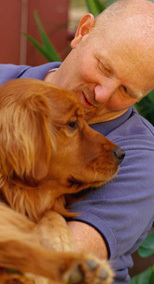 I will work with you to devise a plan to help you and your dog through these behavior problems with a positive approach. All classes are one hour long and last 6 weeks. Rescue adoptions discounted if the dog was adopted during the last 60 days. Proof of adoption is required. Includes puppy play time to teach socialization, puppy handling and some basic obedience commands using positive reinforcement. We will also discuss puppy biting and jumping. We will have lots of puppy play time. Class is limited to 8 puppies. Class pre-requisites: Puppies must be less than 18 weeks at start of class and have had their first 2 DHLPP vaccinations. To help determine if your puppy needs this class, please see the Why Puppy Class and Puppy Play Biting articles. For all puppies that have graduated from Puppy Kindergarten and would like some more puppy play time and socialization. This class incorporates all Basic Obedience. Puppy 2 is by invitation only for dogs who have graduated Puppy Kindergarten. This class will teach you and your dog commands such as sit, down, come when called, stay, leave it, wait at the door and loose leash walking using positive reinforcement methods. Class size is limited to 4 dogs. Must have rabies vaccination and flea treatment. Open to all family members, includes homework and certificate of completion. First class is humans only, please. This class is designed for the family who would like to continue training their dog in a fun and positive environment. Spin, wave, high five and play dead are favorites and course design will include suggestions from you! Intermediate Obedience Classes - NEW!! Intermediate Manners is for all of you that have been through Basic Training and want more. A continuation of Basic Training, we will steer you into more off leash activities, games, college level cues (sits, downs, leave its at a distance). Got reliability issues? We will work on getting behaviors fast and getting the treats out of your hands! We will also focus on requirements to get your dog through CGC (Canine Good Citizen) test. It’s going to be doggone fun! I will provide these services to you and your dog in our private training room. You will recieve an initial consultation write up and a behavior modification plan to get your dog on its way to better behavior. If attending a public class isn't the solution for you and your dog, the training class can work around you! I will provide personal training for you and your dog at our training center. You will be supplied with a course outline and weekly homework as if you were in my public classes. You also have the flexibility to add on some basic home manners into your course. Approx. 6 weeks. The puppy program is designed to assist you prior to the arrival of your puppy and shortly after he is part of your family. Sessions include: basic obedience, socialization checklist, puppy biting, and housetraining. Your puppy should be less than 5 months old. Please call or e-mail for private consultation fees or to schedule an appointment.